When Whitney and Daniel Rabern moved into their new house in Conifer, Colorado, they wasted no time transforming it into a home. The house, which was built in 1984, was in great condition, but it didn't reflect their style. Even when they purchased it, the couple had factored in the cost of renovations and began immediately pouring their efforts into making the rooms look cozy and inviting — and that includes the bathrooms. "Renovations started the Monday after we signed on the dotted line," Whitney Rabern, 28, told TODAY Home, who said they started in September 2017. "Our goals were to make the space feel bigger and brighter." 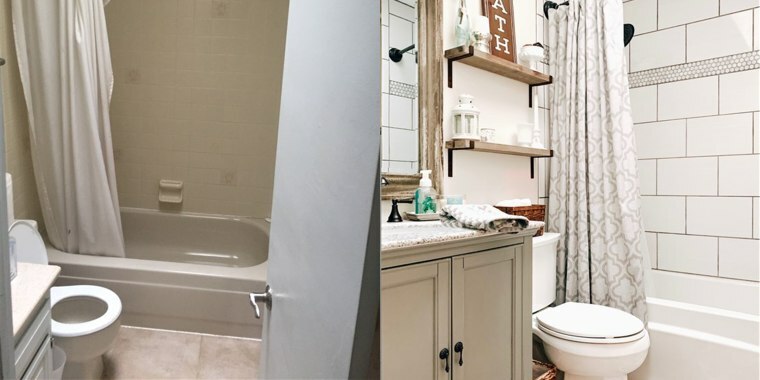 Rabern, a certified public accountant, has managed to document her amazing renovation progress on Instagram. She says that the space now reflects her farmhouse-chic style and "feels like it fits its space in the mountains of Colorado." The one design feature Rabern was sure to integrate into the space? Shiplap, of course! After installing an updated vanity, tile, flooring and all appliances, the entire cost of this bathroom space came out to around $5,000. "'(We wanted to) create a clean and crisp space, and to use shiplap and subway tile somewhere," said Rabern. That shiplap — as well as the mixed textiles, natural wood details and crisp white tiles — have proven worth it. The space looks incredible! Rabern notes that integrating these design elements into the space was intentional, and advises renters hoping for a similar look to utilize secondhand and antique stores. "The space is airy, relaxing and crisp," said Rabern. "It is now a space I enjoy spending time in."